Either side of a path into Battery Gardens, the ground is barer than I expected. There is not much growth in the grass. No doubt the protracted dry spell has played its part, as has the regular passage of scampering canine feet. But give it a few weeks and the place will have a wild, neglected feel. Elsewhere, spring abounds. Along the margins we keep our eyes peeled for what's in flower. 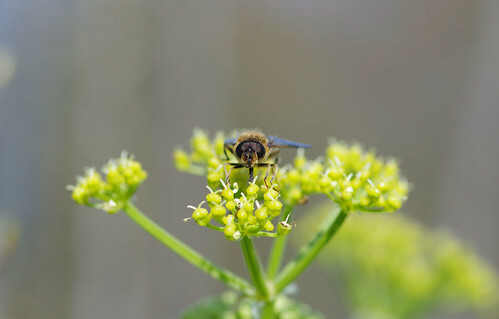 Flies of all descriptions love feeding on Alexanders. 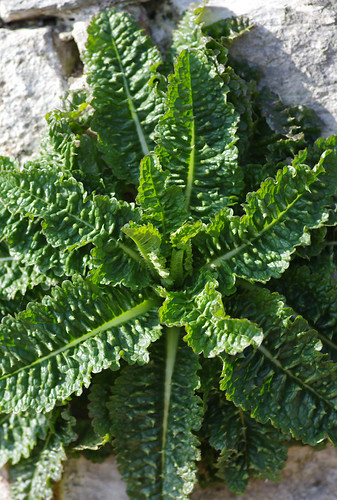 Brought to these shores by the Romans, the plant was originally used as a pot herb. The tubular stalks are like celery and have a similar taste. 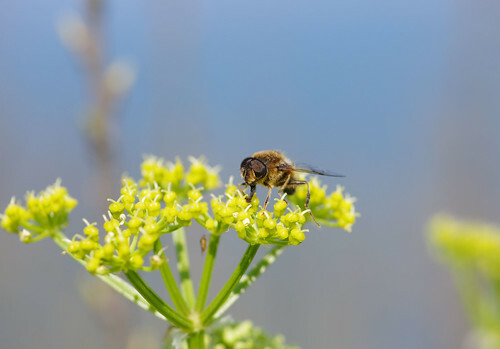 It is abundant at this time of year when in flower and common in these parts, both on the coast and inland along the borders of country lanes and hedgerows. As we turn off right towards the coast path, the wind picks up considerably. 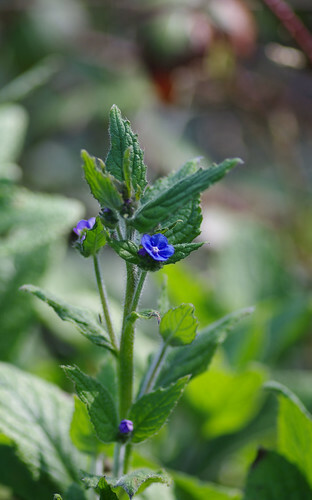 Speedwells are hunkered down, shivering in the breeze but in the more sheltered spots, taller plants are not buffeted around quite as much. Another flower which is common locally, Green Alkanets came to Britain in medieval times and were traditionally used to produce a red dye. 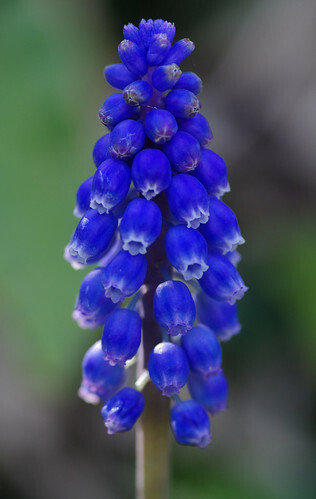 Note how the buds are purple before they become blue flowers. If you've never been to Battery Gardens, it is well worth a visit. The wartime pill boxes and observation posts have thankfully been preserved and there is also a musuem run by volunteers. At Berry Head, a prominent limestone headland, the threat of invasion prompted the construction of Napoleonic forts on an impressive scale. But first we skirt around the margins, exploring a couple of the lanes just outside the Reserve. Many garden flowers become naturalised at the edges of paths and are able to spread rapidly. Whether planted deliberately or dumped among a heap of garden waste, garden flowers can alter the balance and appearance of a habitat. If we were able to travel back centuries in time, the vast majority of wild places and natural havens would look starkly different, especially were we to consider the sheer number of common garden plants that were brought to Britain by botanists and explorers in Victorian times and earlier. 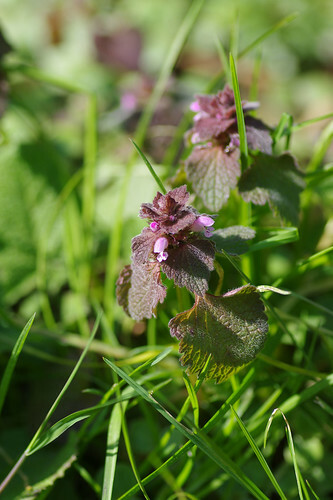 There is a profusion of Red Dead-nettles in grassy verges at the moment. The Latin purpureum provides a clue. The uppermost leaves have a distinct purple tinge to them. Sometimes though it is enjoyable to look at things in a different way; to seek out things that normally you might not notice. When we started trying to identify flowers, we often made the mistake of whole-heartedly focusing on the flowers themselves. Of course, that's only a small part of an intricately complex picture. By neglecting the other parts we we frequently came to the wrong conclusion. Recently we have begun looking at grasses, and particularly ferns, attempting to distinguish the differences between the species. At first glance, from afar, all ferns are green but then they often exhibit different shades of green. And what's most problematic from a photographic recording perspective is the amount of light. 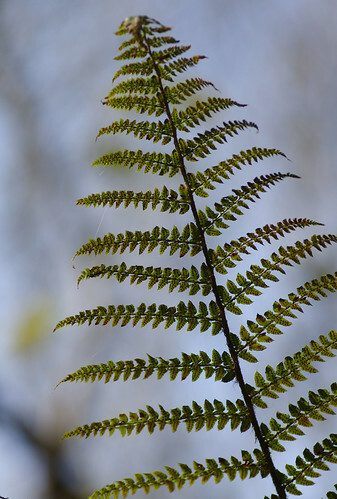 Viewed in strong light, the same species of fern can be seen wrongly as something else when in deep shadows. First, examine the arrangement of the leaves. Many species of ferns have their fronds directly opposite each other so you can eliminate many species and suddenly have a shorter and less daunting list of possible candidiates. This image was then blown up in Photoshop to examine the shape of the leaflets. In this case they had a curved point and also a short stalk. Finally, I looked at the spore patterns. It is better to do this when the spores are ripe later in the year but even so the pattern and number on each leaflet was quite distinct. One of the great things about digital photography is being able to check at home afterwards at your own leisure. I know my back feels better not having to hump around several field guides all day. I usually take one guide out as an immediate reference and leave the rest at home! Around the Berry Head forts we spotted a lot of plant leaves but not many flowers. Some plants, however, are easily identified from their leaves. 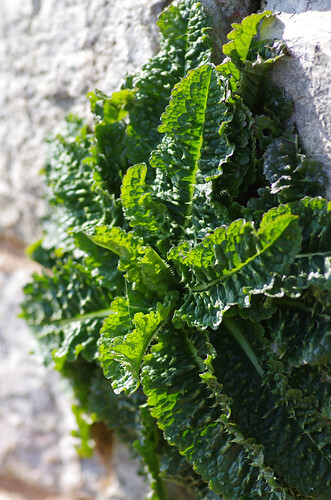 This plant thrives in nooks and crannies of old stone walls and on waste ground. The limestone is probably from the quarry at Berry Head. The leaves have formidable-looking spines. Later in the year, a yellow flower will be visible but for now the leaves provide a prickly spectacle all of their own.